Hi, I am interested in your 1969 FIAT 500 (stock #MHM3166) listed on Autotrader for $14,900. I'd like to get more information about this vehicle and confirm its availability. 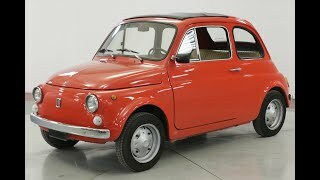 The Fiat 500 (Italian: Cinquecento, Italian) is a rear-engined, four-seat, small city car that was manufactured and marketed by Fiat Automobiles from 1957 to 1975 over a single generation in two-door saloon and two-door station wagon body styles. Launched as the Nuova (new) 500 in July 1957, as a successor to the 500 Topolino, it was an inexpensive and practical little car. Measuring 2.97 metres (9 feet 9 inches) long, and originally powered by a 479 cc two-cylinder, air-cooled engine, the 500 was 24.5 centimetres (9.6 inches) smaller than Fiats 600, launched two years earlier, and is considered one of the first purpose-designed city cars.